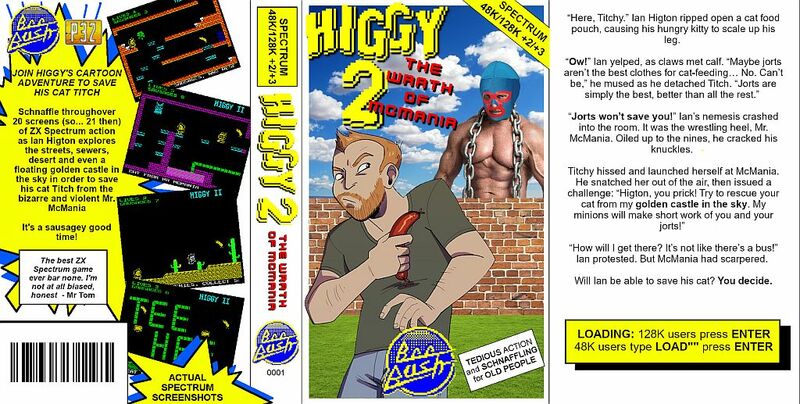 A brand new ZX Spectrum game has just appeared as we have been told by Saberman, that MrTom of Beebush has released the speccy platformer of ' Higgy 2 The Wrath of Mcmania '. Yes indeed another ZX Spectrum game for all to enjoy, and this one puts you in the boots of Ian Higton, on a rescue mission through the golden castle in the sky to save his pet cat Higgy from the oiled up wrestler Mr. McMania. Although graphically Higgy 2 isn't the most amazing game we've seen on the ZX Spectrum, please don't let that put you off. As in this game it's all about the gameplay moving through a multitude of different screens, while collecting sausages and avoiding enemies to rescue your lovable pet cat from the clutches of an evil wrestler! Bendix Engmann : Artwork permission.